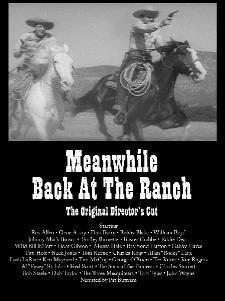 Meanwhile Back At The Ranch was primarily a collaborative effort between Packy Smith and Richard Patterson in 1976. It grew out of Packy’s unbounded enthusiasm for B-Westerns and his desire to make a compilation film celebrating the genre. Richard was a young filmmaker, who had recently completed a film on the life and work of Charlie Chaplin and who also had fond memories of the cowboy heroes of his childhood. Richard suggested making an affectionate tribute in the form of one preposterous B-Western made from scenes from a whole bunch of films. Packy worked up a list of 25 stars he felt needed to be included and began gathering together prints of films for each. Together they looked at over 110 films, duplicating scenes that seemed promising without any clear notion of how they would be used. Gradually an archetypal structure suggested itself, and in the end they used scenes from 78 different movies without changing a single line of dialogue. They knew they were on the right track when one of Packy’s friends, who was also a B-Western collector, viewed a rough cut of the barroom brawl and said, “I never knew Hoot Gibson and Tim McCoy made a film together.” If you want to see where the cuts come from you can turn on subtitles to view the title and date of almost every clip. Needless to say the plot doesn’t hold water and the backers were concerned that audiences might not get the joke. Pat Buttram’s narration was added at the end of the production to help the bewildered, but Pat, of course, did get the joke and only took it to the next level. The film was selected for a special program of compilation films at the 1977 Cannes Film Festival, but it was never released due to legal and financial problems. There were a handful of 35mm prints made at the time, and one of them was used for making this lovingly restored DVD.